In the 2nd arrondissement, Opera is an elegant and quiet neighbourhood. There isnt much night life and by day it is mainly an office and shopping district. 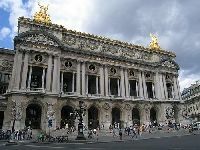 Right behind the theatre of the Opera is the Boulevard Haussmann with all the large shopping stores such as les Galeries Lafayette, Printemps or La Samaritane. The streets are wide and buildings are beautiful. The Opera itself is made of gray stone and golden domes. There are many bars and brasseries where one can grab a quick lunch and it easily accessible using the metro or pay-parking. The Boulevard des Capucines connects the Opera to the Place de la Madeleine where the Madeleine church is the main attraction. The square is considered the centre of good cuisine and houses many famous shops which specialise in chocolate, champagne, caviar and truffles.